Texas can deny birth certificates to children of undocumented immigrants. 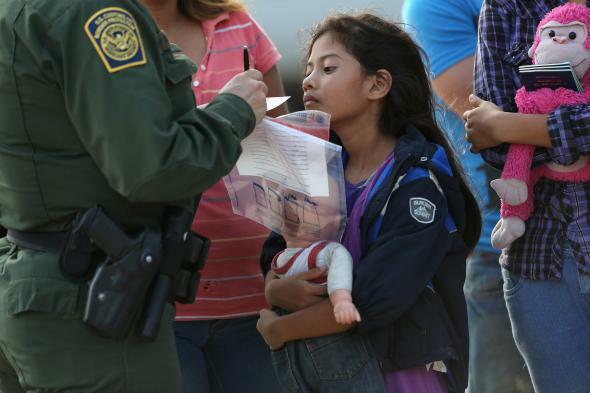 An eight year-old immigrant watches as a U.S. Border Patrol agent records her family information on July 24, 2014 in Mission, Texas. A federal judge ruled on Friday that the state of Texas can continue to deny birth certificates to U.S.-born children of undocumented immigrants. Texas stopped accepting certain types of identification issued by foreign governments, notably ID cards from Mexican consulates, as sufficient documentation to issue a birth certificate to a parent. A group of undocumented parents filed suit against the state in May and the court case is working its way through the legal system.